Osijek schoolboys and students, members of football clubs from Zagreb, Budapest and Pécs, for summer holidays spent in his native city occasionally played football since 1911. Since 1913. Football is played in an organized football section of Upper Hrv falcon. The first club was a pupil Sports Club Slavia, prop. 1916th After returning from the Army 1919th Former players renew work SK Slavia.Osijek typographic workers 1926th founded SK printmaker. That year merged OSK and OSK SK Hajduk Hajduk. The municipality Retfala, near Osijek, founded in 1927. SK Victoria, who immediately competed in the championship city. 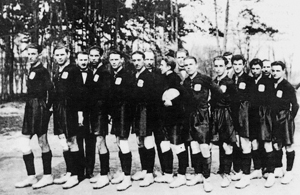 RSK Harmony collapses the 1928th, a group of players that the club established the 1929th SK Croat. Osijek's Club since 1930. competed in city football championship divided into two classes - first played SK Slavia, HGŠK, SK Hajduk ŽŠGD Maccabi and newly formed railroad Academic Club (Zak), and in the second Grafičar Chess Chess Club, Olympia, Victoria Chess Chess Club, Croatia and newly SK Elektra. After the proclamation of the NDH have ceased to operate and SK Slavia ŽŠGD Maccabi, formed in the CSC worker and him. SCHOOL Germany. 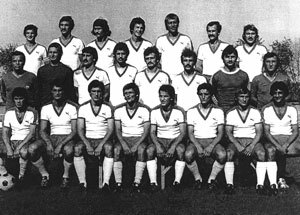 The then four clubs (CWC worker, HŠK Hajduk, SK Germany and the CSC Civil) competed in the govt. football class. II ended. WWII. War sport. clubs is forbidden to use the old name. Therefore, since 1945. gymnastic act Harmony Society, Udarnik, Unity, printmaker (of March 1946. then until 1948. Tipograf), Elektra and the Brotherhood - in all of which have made pre-war sports. society. Already in September 1946. began integrating Unity and Udarnik accounted Slavonia, 1947. more successful activity and rationalization of funds and Slavonia united in Brotherhood proletarians and Harmony and typeface in YouTube. Today Roeselare, which carries the name since 1967. In the first league appearances 1977-80., In the 1980-81 season. in the second game. 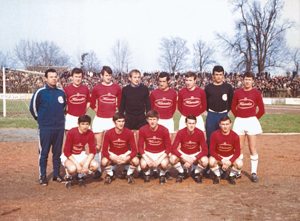 league and immediately returned to the league in the first (1981). Club 1982nd organized youth academy led by professional manager A. whom. The school has become one of the best in the state. From it emerged a large number of international organizations such players. class (D. Suker, N. Bjelica etc.). Osijek is a constant participant of Croatian league. The winner of the competition for the Cup 1999th In Eur. Tied best result was achieved in the UEFA Cup in the 2000-01 season. placement in the third round, where they were eliminated by Slavia Prague.